Frustrations of the heterodox, por Paul Krugman. Ler também When economics students rebel, no Mainly Macro. (…) the heterodox need to realize that they have, to an important extent, been working with the wrong story line. Here’s the story they tell themselves: the failure of economists to predict the global economic crisis (and the poor policy response thereto), plus the surge in inequality, show the failure of conventional economic analysis. So it’s time to dethrone the whole thing — basically, the whole edifice dating back to Samuelson’s 1948 textbook — and give other schools of thought equal time. It is true that economists failed to predict the 2008 crisis (and so did almost everyone). But this wasn’t because economics lacked the tools to understand such things — we’ve long had a pretty good understanding of the logic of banking crises. What happened instead was a failure of real-world observation — failure to notice the rising importance of shadow banking. Economists looked at conventional banks, saw that they were protected by deposit insurance, and failed to realize that more than half the de facto banking system didn’t look like that anymore. This was a case of myopia — but it wasn’t a deep conceptual failure. And as soon as people didrecognize the importance of shadow banking, the whole thing instantly fell into place: we were looking at a classic financial crisis. What about the lousy policy response — austerity and all that? The key point here was that policymakers weren’t basing their decisions on conventional economics. On the contrary, they decided to blow off textbook macroeconomics and embrace exotic doctrines like expansionary austerity and a mysterious growth cliff at 90 percent debt relative to GDP. The disastrous policy responses that have perpetuated the slump are the result of mainstream economics having too little influence, not too much. Now, to be fair, there is a civil war within academic macroeconomics, and what I’m calling “mainstream” is the saltwater side of that civil war. But the critics want much more than to boost saltwater macro at the expense of the new classical guys — they want to drive people like me out of the temple, too. And the thing is that they want to do this even though, as Wren-Lewis says, Keynesian macro has actually performed very well since 2008. What about the new respect given to heterodox thinkers like Minsky, and heterodox ideas like secular stagnation? I agree that mainstream economists didn’t pay enough attention to such people — way back, one of my principles for working in economics was “listen to the Gentiles.” But it’s hard to claim that such work is deeply incompatible with mainstream economics when Janet Yellen embraces Minsky and Larry Summers becomes a secular stagnationist. And what about inequality? Some people are annoyed at Thomas Piketty by presenting his data and ideas in a form that is fairly comfortable for conventional economists, at least those of eclectic disposition. But doesn’t that show that conventional economics is indeed capable of accommodating big concerns about inequality? You fairly often find heterodox economists insisting that to accept the idea that capital and labor are paid their marginal products, even as a working hypothesis to be modified when you address things like executive pay, is to accept that high inequality is morally justified. But that’s obviously not the case: there are plenty of economists who are willing to use marginal-product models (as gadgets, not as fundamental truth) who don’t at all accept the sanctity of the market distribution of income. So this complaint is, in its own way, as much of a distortion as the right-wing claim that anyone who so much as mentions inequality is a Marxist. How should the crisis and the reemergence of very high income inequality affect how we do and teach economics? For sure, it says that we need to do a lot more history, including deep history. Events have also reflected very badly on the style of economics that prizes “microfoundations” based on ultra-rational behavior over evidence, and rules any kind of ad hockery out of bounds. But the heterodox want more than that; they want to interpret recent events as a refutation of the kind of economics Wren-Lewis, or Janet Yellen, or Larry Summers (as economist, not public official), or yours truly does. And that interpretation just doesn’t work. By all means, advance heterodox ideas if you believe they’re right. But don’t claim vindication from events that didn’t actually follow the script you wish they did. Understanding ever-increasing executive pay, por Simon Wren-Lewis. This is the idea set out in this paper by Piketty, Saez and Stantcheva . They call this a “compensation bargaining” model. The paper backs up this theoretical model with evidence that there is a “clear correlation between the drop in top marginal tax rates and the surge in top income shares”. In addition, they present microeconomic evidence that CEO pay for firm’s performance that is outside the CEO’s control (i.e. that is industry wide, and so does not reflect personal performance) is more important when tax rates are low. (Things like stock options). Now one reaction to this model is that it ignores many other social/economic factors that may also have been important. Things like changing social norms and political changes (loosely, the rise of neoliberalism), reduced union power, changes in financial regulations, growing financialisation etc. I think this reaction is correct, but as the authors themselves say, such explanations are “multi-dimensional and it is difficult to estimate compellingly the contribution of each specific factor”. Economists like simple models that can be tested against the data. That is what the compensation bargaining model set out by Piketty et al does. I don’t think it is too much of a stretch to think about bargaining effort as a proxy for all these other factors. A emergência de desequilíbrios externos na Zona Euro é geralmente apresentada como um caso de países que aumentam a sua despesa interna e estimulam assim enormes défices comerciais. Mas há outra forma de formular a questão. Nesta narrativa, são os países do centro que contraem a sua procura interna e, ao fazê-lo, geram pressões deflacionistas que ‘obrigam’ o BCE a descer a taxa de juro para garantir uma inflação de 2%. Esta descida, por sua vez, alimenta bolhas na periferia, que assim se torna deficitária. Em Eurozone Morality Plays, Simon Wren-Lewis mostra que a segunda história até encaixa melhor nos factos do que a primeira. A ler. So which story is right? We all know there was excess in some parts of R, either by governments (Greece) or banks (Ireland), but both countries are small. One way of discriminating between the two stories would be to look at real interest rates. If the ECB was having to react to excess demand in R, we would expect to see high real interest rates. If instead the ECB was having to offset deflation in G, we would see low real interest rates. Here is what actually happened. 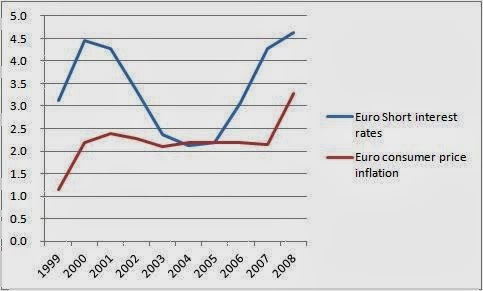 From 2000 to 2007 the ECB kept inflation pretty close to 2%. But it did not achieve this by raising real interest rates. Instead interest rates fell in 2003, so that real short rates were close to zero from 2003 to 2005. This seems much more consistent with the story where G tries to undercut R, and the ECB has to cut rates to keep average inflation at 2%, forcing inflation in R to 3%. Sure enough, 2003-5 were years when the output gap in Germany was significantly negative (OECD estimates -1.4% 2003, -1.7% 2004, -1.9% 2005). Both the ‘undercutting by G’ story and the more traditional ‘excess in R’ story still contain much too much pseudo morality for my taste. The German government did not deliberately engineer zero growth in domestic demand from 2003-5, any more than governments outside Germany (Greece excepted) tried to stoke up excess demand. In an ideal world both could have used fiscal policy more effectively, but the system hardly encouraged that. But this evidence does suggest that seeing the competitiveness imbalances in the Eurozone as simply the result of excess outside Germany is at best only half the story, and at worst not a very realistic story at all. Os cursos introdutórios de macroeconomia começam tradicionalmente com uma apresentação sucinta dos modelos IS-LM e Mundell Fleming. Ambos assumem algo que os bancos centrais deixaram de fazer há décadas – controlar a oferta monetária (hoje em dia, quase todos usam um inflation target). Esta questão não é irrelevante, e devia ser seriamente reconsiderada pelos autores de manuais, como explica Simon Wren-Lewis em Why introductory macroeconomics should ditch the LM curve e Why we should stop teaching Mundell Fleming. Ver também as reacções ao post. But why should domestic interest rates equal world interest rates? UIP tells us they need not. A temporary increase in government spending will raise output, which given a fixed money supply will raise interest rates. This will lead to an appreciation, but the temporary nature of the shock means that the long run exchange rate is unchanged. So the current appreciation implies an expected depreciation, which offsets the additional return offered by higher interest rates. The result is a short run equilibrium where output and domestic interest rates are higher. There is partial crowding out through an appreciation but not full crowding out. We only get some crowding out in the experiment above because the money supply is fixed. If interest rates are fixed instead then we get none. With fixed interest rates, UIP implies the current exchange rate is unchanged when government spending increases, so there is no crowding out. We get exactly the same result as with fixed exchange rates – the complete opposite of what TMF suggests. Simon Wren-Lewis escreve hoje acerca da crise da Zona Euro. Em Is a monetary union without fiscal/political union doomed?, o blogger discute um problema que opôs, durante muito tempo, os euroentusiastas aos cépticos americanos: a possibilidade de uma união monetária funcionar sem um respaldo político que permita contrariar choques assimétricos. Apesar de a versão céptica se estar a ganhar apoio quase consensaul, Lewis defende, neste post, que a questão não é assim tão simples. 2) In probably only one case, Greece, was there a clear problem of underlying fiscal excess. Yet instead of recognising the need for default early on, the union made a futile attempt to avoid it by replacing private debt with intergovernmental lending, which had disastrous consequences. This major and avoidable error produced the worst moment of the crisis, when Greece was threatened with exit. It continues to impose a disastrous degree of austerity on Greece. 3) The fiscal position of other Eurozone economies became critical because the ECB refused to act as a lender of last resort. If the ECB had introduced its OMT programme two years earlier than it did, the crisis might well have dissipated very quickly. This is hardly wisdom from hindsight, as anyone reading Paul De Grauwe (or indeed this blog) will know. Market reaction always had much more to do with the ECB than the fiscal position of the countries involved, an observation that inspired my first blog post and which research confirms. 4) The current double dip recession in the Eurozone is largely about a collective failure of fiscal and monetary policy. The position of the Eurozone would look significantly better if the ECB acted more like the US Fed, and if Germany and other fiscally untroubled economies were less obsessed with austerity. Neither has much to do with the absence of fiscal union. To use evidence from one very badly designed test case to condemn the whole concept of monetary union without political union is far too hasty. It is also potentially very dangerous. We should not forget that monetary union itself was encouraged by a belief that the fixed exchange rate regime that preceded EMU was untenable because of market pressure. (For more on the origins of the Euro see Harold James here.) The lesson of Eurozone failure so far is mainly about bad design, rather than disproof of concept. If this failure leads to a fiscal and monetary union imposed from above on an unwilling electorate, by an elite that played such a big part in creating the current failure, we may go on to find out that a badly conceived political union could be even more disastrous than a badly designed monetary union. Se o problema da economia americana é falta de consumo, por que é que a Fed não se limita a imprimir dólares? Simon Wrens-Lewis explica, em What do we mean by helicopter money, por que é que é praticamente isto que Ben Bernanke está de facto a fazer. Yet we can now see why in reality the two may not be equivalent, because consumers may not be Ricardian. In particular, some may have been asking their local bank for a loan to buy a car, and the bank had refused because it has become very risk averse since the crisis. For these credit constrained folk, the central bank’s cheque is just like the loan they couldn’t get. So they use the cheque to buy the car, and reduce their future consumption to pay the poll tax later. Instead of buying government debt, they have bought something real, which will increase aggregate demand for sure. If this is the reason people call for helicopter money, then I have a lot of sympathy but only one problem: what difference is this from an expansionary fiscal policy combined with further QE? Instead of the central bank sending people cheques, the government can send the cheques using money borrowed by selling debt, and the central bank can buy the debt by printing money (i.e. QE). In this sense, helicopter money is just another name for a fiscal stimulus combined with QE. We have the QE, so why not call for fiscal stimulus rather than helicopter money? Uma anedota popular em economia diz que só há duas economias: a microeconomia e a má economia, numa crítica explícita à falta de fundamentos da macroeconomia. Simon Wren-Lewis, que tem escrito algumas das coisas mais interessantes acerca de modelização, volta hoje a criticar a ideia de que só alicerces macroeconómicos dão solidez à macro. Arguments for ending the microfoundations hegemony, no Mainly Macro, fornece cinco boas razões, das quais cito apenas duas.